I’ve always loved cemeteries, and used to spend a lot of time visiting them and wandering from grave to grave, thinking about the impact each person makes on their world. 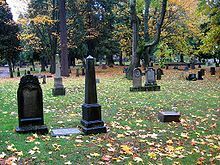 When I was a kid growing up in the New Jersey suburbs there was an old cemetery nearby we called “The Ghostly Graves.” It was a 15-20 minute walk through the woods, and I spent many days reading all the inscriptions on the markers and then lying on my back in the adjacent meadow. I’ve kind of gotten out of the habit of visiting cemeteries. Although I’ve lived in Portland over 15 years I’ve never visited Lone Fir, our oldest pioneer cemetery with burials dating back to 1846. Heading home from an errand this morning I drove along one side of the cemetery and it crossed my mind to go in. It was a glorious sunny day and everything looked beautiful. It took me a while to find the entrance, which was clear around the other side a few blocks away. I parked down the street and stepped through the gate, taking it all in. I imagined maybe I’d see someone mourning at a graveside and would brighten their day with the 14th Hundred. There were a couple of maintenance guys riding on lawnmowers but it was otherwise very quiet. A couple of people jogged past, and a woman walked by pushing a stroller. 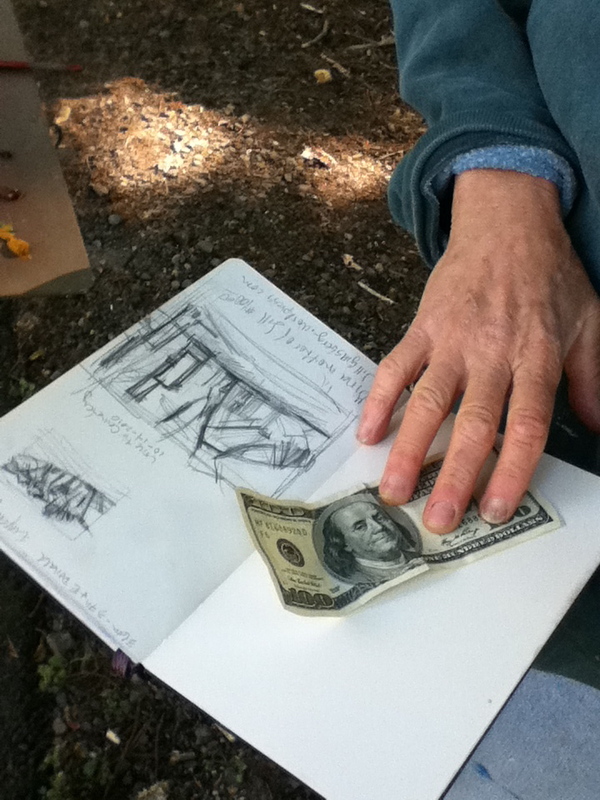 I saw a few people with sketchbooks and a guy in a bicycle helmet sitting on the grass having a snack. Should I try harder? I felt pretty torn about it, like maybe I was missing a big opportunity. Maybe a little hurt, too, that my gift had been turned down. I walked away. The cemetery really is beautiful, and there are lots of interesting headstone designs and inscriptions. One style of newer headstone that seems to be popular among members of a certain community includes very large and lifelike photos of the deceased on the gravestone. It’s quite unsettling. There was a mix of real and artificial flowers on the graves, and one covered with Halloween decorations and a hand lettered sign that said “Dad”. I kept walking and saw a woman up ahead bent before an easel. I walked closer and said hello. She kept painting. I watched for a few seconds, then said “Do you mind?” “Help yourself,” she shrugged. “For a minute.” I watched her dip her brush into the paint – first green, then blue. She dabbed the color onto the canvas. I looked at the scene in front of us, then back at the painting. “Actually, do you mind if I interrupt you for a minute?” She stiffened. “What’s up?” I told her about my project and handed her the $100 bill. She looked at me for the first time. “Are you kidding me!?? Are you kidding me? ?” She must have said it a half dozen times. I was kind of chuckling inside, thinking about Gloria yesterday and how grumpy she was at first. 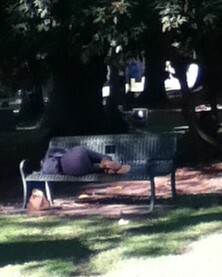 I thought back to the woman on the bench. 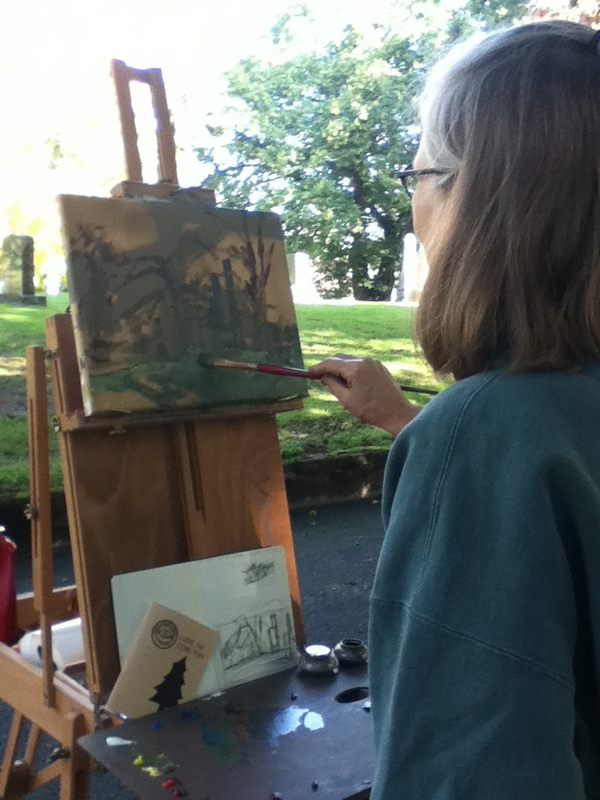 The painter told me her name was Cheryl and it was her first time painting at Lone Fir. She had been inspired to do it after reading about the cemetery founders in a historical comic book put out by the Dill Pickle Club. She wanted to know if I lived in the neighborhood and how I came to be there today. She gave me a big hug and said she would do something good with the money. As I walked back to my car I looked for the young woman in black. The bench was empty. I think that’s what I would say too “Are you kidding me” – this just DOES NOT HAPPEN in the real world!!! I would LOVE to hear these recipients stories about receiving your gift! I discovered your blog recently and have been enjoying it very much. Not only because I admire what you are doing, but because you’re such a good storyteller. Your writing is vivid and honest and personal, and it really pulls me in as a reader. I hope you’re thinking about writing a book! Thank you, Kate! I’m so glad you are following along. After all these many many years of knowing you, I had no idea that you loved cemeteries. So do I! I find them historically fascinating, beautiful (the way parks can be), poignant, and comforting. It must have something to do with the fact that my father used to take my sister and me walking in a cemetery when we were little and also that during the summers (which we used to spend in Western Hungary with my paternal uncle and his family, as we used to say, “at the feet of the Alps,” we would always go visit the rural cemeteries with graves of ancestors, and I loved the views (some down onto valleys) and stories that came with the stones. While I lived in Brooklyn, Green-Wood cemetery was one of my favorite destinations. Now a painting and painter enters your remarkable story and, you her life…. Send you globs of love (or is it gobs????). I remember some wonderful photographs you took in a cemetery. My Dad and all the rest of the family is buried in Brooklyn; I can’t remember right now but maybe at Greenwood. love you. jill, this is quite a remarkable project. i am glad our comic on lone fir led to such an amazing story! if you’re interested in attending a dill pickle club event, let us know. we have a tour of african american murals, oct 22 (by bike) and nov 12 (by bus). we’d love to invite you to be a guest at either. let us know if you’d like to take us up on the offer! this is quite a story! glad the dill pickle club made such a meeting possible. we’d love to invite you to a dill pickles event. we have a tour of african american public art happening oct 22 (by bike) and nov 12 (by bus). we’d love for you to be a guest to either. let us know if you can take us up on the offer. Lone Fir is a lovely place. I grew up across the street and it was my park as a kid. I would encourage you to visit on Halloween, when there is a guided tour called The Tour of Untimely Departures. Actors portray ‘residents’ and you can learn more about the beautiful, historic site. Keep up the inspiring work, Jill! What a wonderful way to honor your mother, bring unexpected happiness to strangers and live joyfully.